It takes extraordinary talent to both sing and rap capably in four different languages. To do so while dancing for 45 minutes is especially impressive. But Pierre Kwenders made both look as natural as breathing on Saturday afternoon. Backed by two guitarists and a drummer, the Kinshasa-born, Montreal-based artist held his audience in rapt attention without ever losing his stride or letting his infectious smile lapse. Opening with "WTFU" from last year's MAKANDA at the End of Space, the Beginning of Time, Kwenders and his band thrived on fusion. 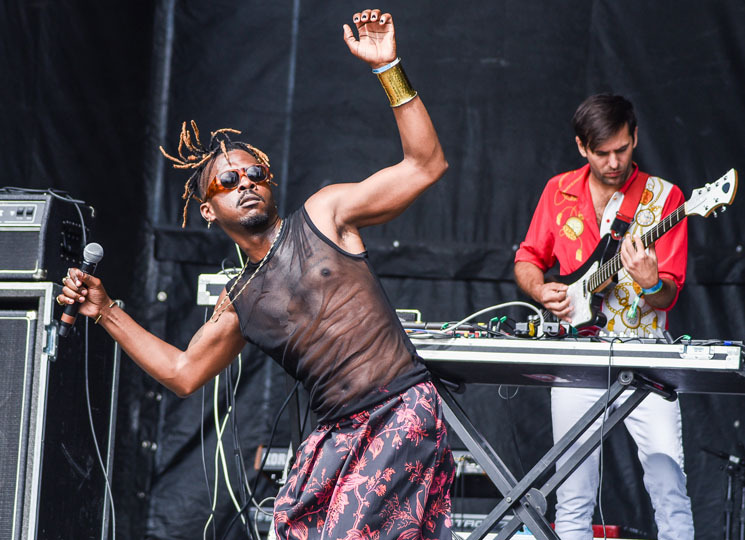 They blended organic and synthetic sounds, Congolese rhumba with hip-hop and dance music, producing a sound both nimble and towering. "Sexus Flexus Nexus" soared on a combination of smooth wah-wah guitar and warm saxophone samples, while the lush arrangements of "Woods of Solitude" showed off the skills of every player onstage. The music was exceptional, but Kwenders' stage presence stole the show. Shimmying, twisting, and baby-stepping across the stage, he could snap from jerky to fluid movements in an instant, his arms held in the air or out to the crowd. Imploring festivalgoers to dance, his enthusiasm proved infectious; even the notoriously movement-averse Toronto audience had loosened up by the end of his set.